Size of this preview: 800 × 465 pixels. Other resolutions: 320 × 186 pixels | 640 × 372 pixels | 1,024 × 595 pixels | 1,576 × 916 pixels. English: The Fukushima I Nuclear Power Plant after the 2011 Tōhoku earthquake and tsunami. 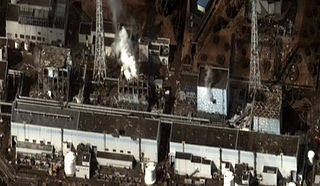 Reactor 1 to 4 from right to left. Wikimedia has received an e-mail confirming that the copyright holder has approved publication under the terms mentioned on this page. This correspondence has been reviewed by an OTRS member and stored in our permission archive. The correspondence is available to trusted volunteers as ticket #2011031710013124.